I make the Alton Brown Chewy Chocolate Chip Cookies for people who like their cookies dense, chewy and kind of soft (but not cakey). The recipe calls for bread flour. With all the other recipes out there I tend to forget about this one, but it really is a crowd pleasure thanks to the texture. Adapted from a recipe by Alton Brown, bread flour gives these cookies a nice shape -- solid on the outside and kind of soft and dense throughout. They're chewy rather than crunchy, but shouldn't be cakey. Melt the butter in a medium saucepan over low heat. Let it cool slightly. Meanwhile, mix together the flour, salt, and baking soda; set aside. Pour the slightly cooled melted butter in a mixing bowl. Add the sugar and brown sugar. Cream the butter and sugars on medium speed of an electric mixer. Add the egg, yolk, 2 tablespoons milk and vanilla extract and mix until well combined. Add the flour mixture and stir by hand until thoroughly combined. Stir in the chocolate chips. Chill the dough just until it is thick enough to scoop, then using a 1/4 cup measure, drop big gobs of dough onto a parchment lined plate or cookie sheet and let the gobs of dough chill for several hours or until very firm. Preheat oven to 375 degrees F. Arrange chilled dough gobs about 6 per sheet. Bake for about 14 minutes or until golden brown, checking the cookies after 5 minutes. Rotate the baking sheet for even browning. Cool completely and store in an airtight container. tg,Since you asked, I’m going to make a change in the directions. You should form your mounds with a very large cookie scoop or a quarter cup measure. They’re huge cookies! Baking times are never exact, so you’ll want to watch the cookies closely. But I generally scoop about 6 big quarter cup mounds and bake them for 12-14 minutes. the alton brown cookies – yr instrux say “6 cookies per sheet” – but i’m wondering how big a portion of dough to lay down – “rounded teaspoon”? I don’t have many good recipes on Recipezaar, because I just haven’t had time to keep up with posting there. But my identity is AnnaCG. Me too, i never fail to go to recipezaar what’s your nickname? You know, I never got around to eating a Greenwich brownie today. Instead, I ate a frozen, thawed Whopper cookie, which was extra delicious.If you do the 8 inch pan of Outrageous brownies, check them at 18 minutes. Those brownies are so rich that an 8 inch pan makes plenty. I like Flora’s hideout, but can’t vouch for all the recipes. Like you, I much prefer recipes which has been reviewed. Recipezaar is my fave! ANNA, did the greenwich brownies tasted better the next day?Thanks so much for the inormation you’ve shared (quartering the Outrageous brownies recipe) for i have no idea on what pan size to use when the recipe’s divided Oh, your right, the other Greenwich recipe is just the half of the other one hehe, thanks!By the way, on FLORA’S Recipe list.. are most of the recipe listed good and full proof? Coz i’m quite hesitant in making recipes with no reviews from people..
Jen, you’d better renew your subscription too!As for the cookies, I think the Nielsen Massey Cookies are drier. I don’t mean they are dry in a bad way, just not as thick and moist as Alton’s. Anna – I completely forgot you were going to be in the January CL! My subscription ran out so I better run out and buy it! 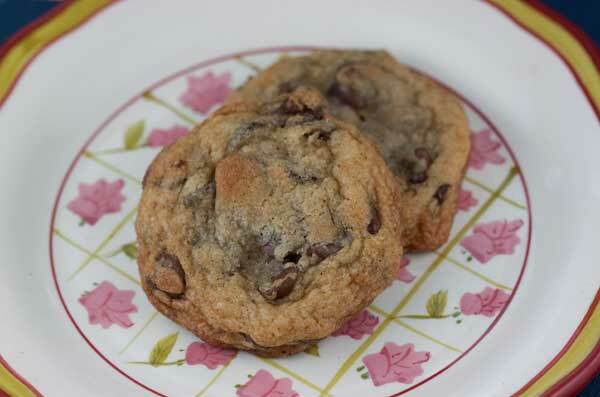 Why doesn’t CL take Splenda recipes – I always wondered why they didn’t have recipes that called for it?How does the Chewy compare to the Nielsen Massey Choc Chip Cookie? Thanks, Amy!You’re so sweet.I looked at your Alton Brown cookies and they’re shiny as well. Guess it’s the melted butter/sugar thing.I’m making baking up the rest of the dough this morning. Anna! You and your smile look BEAUFIFUL. Congratulations, that is is sweet magazine coverage!p.s. I made The Chewy last January. The dough freezes and bakes really well. I love them. Michele, I believe it’s sugar, but what did I do to the sugar to make it glossy? Did it melt in the hot butter maybe? I’ve noticed I’ve gotten shiny tops on brownies which have used melted butter as well. Randi, surely you can find it for less. I’ll be on the look out.That being said, you may not like the book. She uses less fat, but still uses a lot of sugar. Randi, I hope the revised version works out for you. My, I used the Greenwich Village brownies. Looks like the “brownstone” version is a 1/2 size of the “village” recipe baked in an 8 inch pan. Also, Randi can answer for herself, but I think the Outrageous Brownies are incredible. They are extremely dense and fudgy. The recipe is huge that I’ve always quartered it and baked the brownies in an 8 inch pan. Great photos and article in CL, Anna! Cookies and brownies look great! It’s the sugar that gives that nice glossy look. Hi anna!I noticed there are two Greenwich brwonies(Greenwich Village Brownies& Greenwich Village Brownstone Brownies) which one did you bake? I’m always on the lookout for fudgy and dense brownies RANDI, how did Ina’s Brownies turned out when you baked them? I clicked on that link for one smart cookie and it shows 66.89 for the price. I emailed the seller and he told me the price was correct!! Ridiculous. Hi Randi!Thanks! Do you like my goofy smile? I was pretty happy at the moment — a bit awestruck, I suppose.As for the Splenda, I’ve had good results using it in the cake. The proportions I used were 1 1/2 cups Splenda (straight — not Splenda Blend) and 1/2 cup brown sugar. Hope that helps!The frosting is mostly marshmallow creme, which you might not be able to deal with since you are diabetic. If that’s the case, here’s another frosting I use.Chocolate Cream Cheese Frosting (optional)4 oz reduced cream cheese, softened4 T. light butter 1/2 cup Splenda2 tablespoons baking cocoa1 teaspoon vanillaLet me know if that works for you. But yes, I have definitely used Splenda. oh and i( along with another person) baked Ina’s brownies at the egullet gathering last July. I wasnt impressed. Of course, I didnt do all the mixing, someone else helped me. But, I think they are supposed to be refridgerated for a few days before consuming and we ate them right away. Hey Anna, I got my new CL today. Congrats!! the cake looks good except I’ll need to sub out some splenda for all the sugar since I’m diabetic. Do you think if I subbed out 1 cup it would still work?